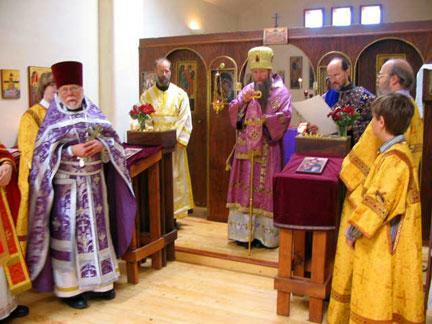 March 25.12 2007 On the Sunday of St. Mary of Egypt (March 25), the parish of St. Juliana of Lazarevo in Santa Fe, New Mexico welcomed His Eminence Archbishop Kyrill in his first visit to the newest parish in the Western Diocese of the Russian Orthodox Church Outside of Russia. The original church was built in Santa Fe over 30 years ago by the Ossorgin family (direct descendants of St. Juliana), who emigrated from Paris where they lived in exile after the Revolution. The current church was erected in 2000 on three beautiful acres of residential land overlooking the famous Plaza and the Sangre de Cristo mountains. The grounds contain the church, rectory, studio/hall and walled hacienda-style gardens with inspiring landscaping and indigenous plants, cacti, and fruit bearing trees. During his visit, Vladika, who was accompanied by Deacon Dmitri Jakimowicz, ordained Anthony Ryder to the diaconate and tonsured Professor David Starr as Reader. Moreover, His Eminence recognized the oldest parishioner, Juliana Ossorgin (who bears the name of her ancestor and our patron, St. Juliana of Lazarevo) for her devotion to the Faith, preservation of Russian language and culture while in exile, and her participation in erecting the first Russian Orthodox church in New Mexico. Miss Ossorgin also carried the Relics of St. Juliana from Paris to Santa Fe, New Mexico where they remain for veneration by all the faithful. In addition, Vladika provided recognition to our dear neighbors, benefactors, and staunch supporters of St. Juliana’s, Timothy and Carin Winneberger. On Saturday March 24, by personal invitation from the Board of Directors, Archbishop Kyrill toured and blessed St. Elizabeth’s Shelter, the only homeless shelter in Northern New Mexico, which serves and aids homeless men, women and children. His Eminence’s visit opened a much needed dialogue and ministry for the growing Orthodox population in Santa Fe within the community and its respected service-based organizations. Finally, no hierarchal visit would be complete without a joyous Lenten Trapeza with traditional Russian, American, and Southwest delicacies, including bountiful libations. Everyone left spiritually uplifted and rejuvenated ready to continue Great Lent in anticipation of a Joyous Pascha. ARCHPASTORAL VISIT October 24.11, 2010 On the Weekend of The Holy Fathers of the Seventh Ecumenical Council, the parish of St. Juliana of Lazarevo in Santa Fe, New Mexico welcomed His Eminence Archbishop Kyrill and Deacon Dmitri Jakimowicz who made their second visit to our church. Area clergy and visitors filled the church and helped make this a memorable occasion. Vladyka thanked Fr. Luke for his many years of service in a heartfelt speech that included an awarded icon of the theotokos. He ordained David Starr to the diaconate ensuring that Fr. Luke has a deacon serving when Fr. Dcn Anthony is away on business. Fr. Dcn. David obediently agreed which is no surprise since both he and his wife, Elizabeth “Betsy”, have loved and worked extremely hard for this parish for a period of time best expressed by the parish’s prayerful wish for them: Many Years! Thank you His Eminence Archbishop Kyrill and Fr. Dcn. Dimitri for recognizing and supporting the hard work of our priest and for making our entire parish feel very special under your continued care!